The US tax code, at 67,000 pages, is an embarassing swamp of esoteric gobbledygook, unworthy of a nation which is supposed to be the shining light of capitalism, entrepreneurship, and productivity. I don't need to remind any US residents on how time-consuming and/or costly their own tax preparation has been, but suffice it to say that if fees, time, processing resources at the IRS, and postal services are added up, the total burden adds up to $400 to $600 billion a year in transactional wastage for the US economy. This is as large as the total economy of a country like Switzerland or Belgium. Just about the best thing that Washington could do to further stimulate the already robust US economy is simplify the process through which taxes are collected. Again, this is not a tax cut, but merely a reduction in the transaction costs of extracting the same amount of revenue from taxpayers. Yet, the resultant productivity gain would increase GDP by 2-3% almost immediately. I am baffled why not just the Federal Government, but even many State Governments are unwilling to collect the same revenue through a simpler process. I hear rationalizations about how "tax accountants don't want to go out of business", but that excuse makes about as much sense as tearing up roads and relaying them repeatedly in order to employ workers. And since when has there been a 'tax accountants lobby' powerful enough to obstruct the wishes of just about every other taxpaying citizen and business in America? The even bigger irony is that simple tax codes have been adopted in former communist regimes like Russia and Ukraine. Tax evasion has predictably plummeted, even as revenues have surged. Why is America unable to enact a capitalist principle that former Soviet states have implemented? On the political side, while neither party has indicated any intention of simplifying the tax code, Michael Mandel at BusinessWeek has created some revealing charts on tax rates by income bracket, both before and after various tax cuts. Between 1981 and 2004, the lower the income quintile, the greater the magnitude of tax rate reduction has been due to tax cuts by Presidents Ronald Reagan and George W. Bush. If anything, the highest quintile is the only tier that has seen virtually no tax rate relief. Also note the line chart showing the tax rate drop for the middle quintile after 2001. This utterly destroys the fashionable socialist statement that Bush's tax cuts were "for the rich" - a line often spewed by someone who is incapable of detailing precisely which tax bracket was lowered by how much. Of course, you may not have this chart handy the next time you encounter someone who opposes tax cuts for reasons they can scarcely explain. Thus, as usual, such a debate is won by forcing them to demonstrate knowledge of the subject behind their own question, through a question of your own. "....tax cut for the rich"
"Please explain which tax bracket dropped by how much through Bush's tax cut. I need to see that you know how much the lower brackets dropped by." "Why do you oppose Bush's tax cuts, but not Clinton's 1997 tax cuts? Clinton cut taxes on capital gains, which certainly is good for the economy, but is far more skewed towards the rich than income is. Why don't you describe Clinton's tax cuts in more detail for me?" At any rate, these debates are easy to win. But I will not excuse President Bush or Congress from refusing to address tax simplification, and letting the horrendous statistic of 19 to 23 cents being wasted in the process of collecting each revenue dollar continue. Hope is on the horizon, however. Globalization is introducing market forces that are putting downward pressure on tax rates and tax complexity worldwide. Ireland has outperformed the rest of Western Europe by a wide margin in the last 12 years due to vastly lower taxes, which in turn attracts workers and businesses away from higher-tax welfare states. If the US sees an exodus of business incorporations that are instead flocking to Ireland or Bermuda, perhaps Washington will finally act. Why is America unable to enact a capitalist principle that former Soviet states have implemented? Josh - I don't see it. Russia's high level of corruption and alcoholism and low birthrate will hamper its recovery regardless of what they do with the tax rate. To the OP. As long as some people are richer than others, the Democrats will have something they can run on. They will advocate for more regulation of those who make money. Everyone agrees in the abstract with the idea that there's too much regulation, but those suspicious of capitalism are able to paint each new regulation as a good idea nonetheless. Sad. What are peoples thoughts on the 'fairtax'? Its a consumption tax that would replace the current taxation system in place. Think of how many highly-educated CPA's and tax attorneys there are, and what exactly they do to further grow the economy: Nothing. They produce nothing, create nothing, invent nothing, perfect nothing. They are leeches on the productive class. They exist largely because of the byzantine tax code, shunting dollars here and there not for reasons of market efficiency but to shelter their employer's assets. Dollars often go to strange places, unproductively, just because it makes sense from a tax perspective. Now think if all of these unproductive people, the CPA's and tax attorneys, were suddenly out of work because of a radical simplification of the tax system. These smart, capable people would find other work, most likely they would find work that enables them to truly contribute, by making businesses more efficient, creative, and productive. The economy would benefit greatly. The reason the tax code has become so nasty is because politicians derive a lot of their power by manipulating it. Lobbyists are either looking for handouts or for favorable treatment via regulation or tax incentives, and politicans respond. If you took tax code manipulation out of the hands of politicans, they would lose a lot of power, and power is something that the political class doesn't want to let go of. Here's a law you'll never see: Every state and federal elected politician must do their own taxes. No CPA's or attorneys. Not even H & R Block. Many politicians are wealthy and have complicated finances - forcing them to reconcile their finances with their tax code would be the fastest way to bring about badly-needed reform. You are right, of course. But this still remains a unnecessary burden that is downright un-American. There is nothing that would cause an immediate, guaranteed improvement in the economy as much as this would. Foreign competition forcing change is the only hope. For first $30,000 earning, everyone pays a flat $2000 tax. For your 30,000 to 60,000 earnings, you pay 15% on the earnings that you spend. No tax on the portion you save. On earnings above $60K, you pay 20% for the portion you spend, and nothing on the portion you save. No tax benefits for ANYTHING, including mortgage interest. Why the $2000 on the first 30K? Because everyone should pay some taxes. People who pay nothing ara cavalier about the tax burden, because it is shouldered by others. Oh, and adjust the numbers to achieve whatever effective tax rate (or collection target) you want to achieve. Do this, and watch the economy zoom. A chief reason the tax code is so complicated is because using the tax code to create incentives is viewed as more desirable than direct regulation to produce similar outcomes. Thus, for example, rather than requiring a certain level of efficiency inehicles, we get a tax deduction for purchasing a hybrid car. Abandoning the complicated tax code will mean that those policy will be enacted by other, possibly more coercive, means, or abandoned entirely. A different Josh, that is a very fair point. The problem is government officials, elected or permanent, who want to sorta kinda make people do what they want them to. The tax code is simply the vehicle by which they do this. Whether we went to Friedman's negative income tax, a flat tax, a sales tax, or any similar mechanism, they would seek other ways to twist arms to get us poor benighted citizens to do what we "should." We might get a head start on 'em before they caught up, however. Are these overall tax rates, all federal taxes or just income tax rates? Why don't you include the graph of all tax rates (including state, local and sales tax)? This is all Federal income tax, including income, SS, and Medicare. No state or local taxes. Why didn't you include state taxes, including sales, property and use taxes? Because the topic here is federal taxation, and state/local taxes vary widely. I want to keep it to one chart. Small business income taxation is burdensome not primarily because it takes a lot of time to complete the form. These are a burden and these costs are spread over less revenue than in a large business. But, the number one factor is the great deal of record keeping activity that goes into determining revenue and expenses from myriad small transactions. Well, that might be the case, but it is certainly interesting that if you include total tax burden, the results are exactly the opposite as the ones you get by focusing only on federal tax. This article is could make a perfect example for the book "How to Lie with Statistics." 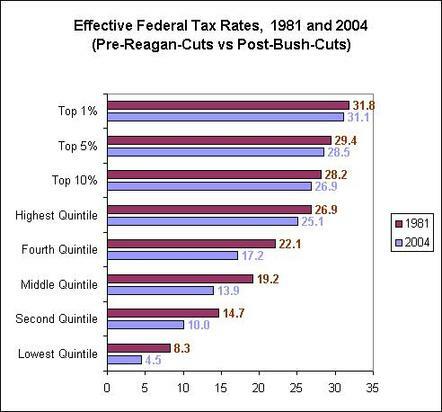 Let's look at not the percentages but the actual post-tax incomes of these quintiles before and after the Bush tax cut. If you were the average person in the lowest quintile, in '03 your post-tax income was $14,500; in '04 it $14,700. $200 extra. Woohoo! If you were the average in the top quintile in '03, your post-tax income was $143,600; in '04, $155,200. So your tax cut wound up being almost equal to the total post-tax income of someone in the bottom quintile. If you were in the top 1%, it gets even better: the numbers soar from $722,300 in '03 to $867,800 in '04. Again, your tax cut is almost equal to the post-tax income of the average top-quintile earner. Your argument is boilerplate socialism that died years ago. er.. why? Percentages are what matter. Even after Bush's tax cut, the higher quintiles pay a much HIGHER percentage of their income than the poor. In dollar terms (the wrong way to look at it), the rich pay several times more than the poor, thus destroying your quantitatively-challenged argument. Again, your tax cut is almost equal to the post-tax income of the average top-quintile earner. And the taxes that the top 1% pay is still several times the income of the bottom earner, even after the tax cut. Why don't you oppose Clinton's tax cuts in 1997, which were on capital gains only, and thus far more skewed to the rich than Bush's income tax cuts (I personally approve of Clinton's tax cuts). You are an example of how illogical fanaticism has reduced your own ability to prosper in a meritocracy. How do you know that I don't? I didn't mention it, but I also didn't mention my opinion on Bruce Willis as an actor. Why? I can't buy dinner with 1%. I can buy dinner with $10. But if you want to talk about percentages, let's do. If you were in the bottom quintile, your post-tax income went up about 1.5%. If you were in the top quintile, your post-tax income went up about 9%. You make an argument, and I try to counter it with facts and figures. You respond by suggesting that for disagreeing with you I am a socialist and fanatic. I genuinely regret having set foot here. So why don't you elaborate on what you disapprove in Clinton's 1997 tax cut? I approve of it, by the way. How about I buy 1% of your income for $10? Would you agree to that deal? If you were in the bottom quintile, your post-tax income went up about 1.5%. If you were in the top quintile, your post-tax income went up about 9%. er...As did their pre-tax income, so have made no point on taxes. The rich-poor gap is widening, as the free market is becoming better at matching compensation with contribution. Do you know that the top 1% of income earners pay 38% of all taxes? That the top 10% pay 74% of all taxes? What number would you be happy with? I genuinely regret having set foot here. Socialists are averse to logic and meritocracy. You are running out of places where socialism is still popular, as the stunning defeat of socialism is the biggest event of the last 15 years.